The San Luis Obispo Bodhi Path Center will host one more day of mantra rolling. 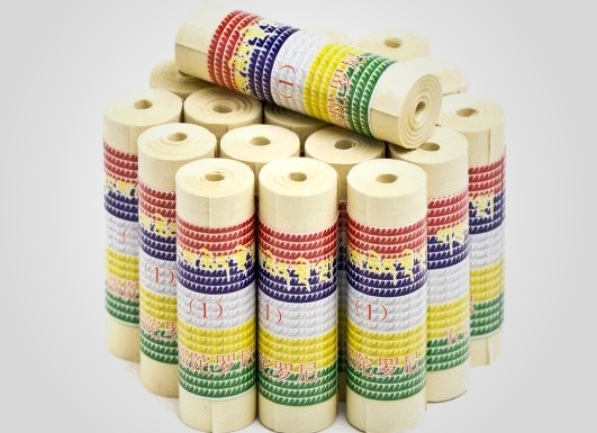 All the mantra sheets we received have been rolled. Now they need to be covered and wrapped. We’re planning a morning (9-12) and afternoon (1-4) session. If you can help with this unique and mindful opportunity, please contact sanluisobispo@bodhipath.org and let us know the session you’d like to attend. Shamar Rinpoche, founder of the Bodhi Path centers worldwide, passed on in 2014. A traditional Tibetan buddhist Reliquary Stupa Structure at the US Bodhi Path headquaters in Natural Bridge, VA, has been under construction to hold Shamar’s relics. The structure will house one of the few golden stupas in the world built for Rinpoche’s relics, and the only one in north America. The stupa will be consecrated this summer. As part of the consecration process, it will be filled with many thousands of mantras printed on paper, rolled up and bound. Each Bodhi Path Center has been offered a part in creating some of the mantra rolls to be placed in this stupa. The San Luis Obispo Center has accepted this honor. 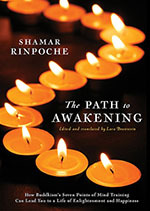 Join us from 10-12 for group meditation and a continuing discussion of Lojong (Mind Training) as presented in Shamar Rinpoche’s commentary “The Path to Awakening”.